Step 1: Whisk the orange juice, vinegar and olive oil in a bowl. When the dressing is ready, put it in the refrigerator. Step 2: Wash the arugula well, drain and roughly slice it into pieces. 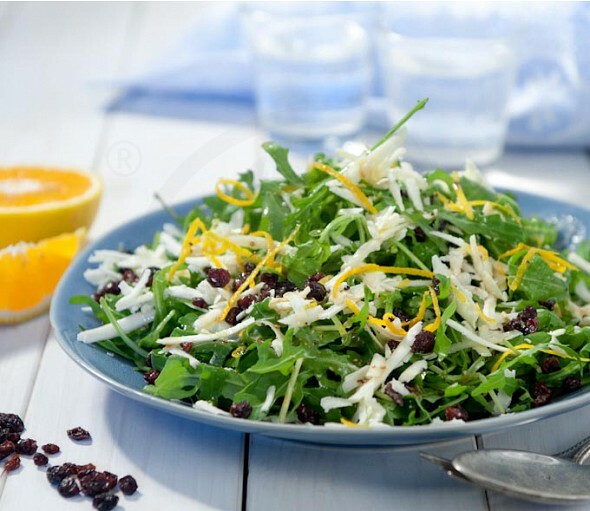 Step 3: Bring together the arugula, currents, dressing and half of the grated cheese in a salad bowl and mix well. Step 4: Serve the salad garnishing it with the rest of the cheese. The spicy arugula is combined with one of the rarest and most delicious Greek goat cheese, melichloro cheese, all the way from the beautiful island of Lemnos.